Our "friends" in Lorraine are very proud of their Mirabelles. Small round yellow plums with not a lot of flavour. Good enough for schnapps, certainly. 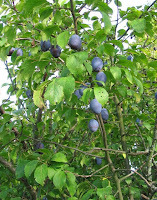 We have a couple of Mirabelle trees & make a few tarts & jars of jam every year, but with no great enthusiasm. The main charm of the Mirabelle is that you can easily pick all the ripe fruit just by shaking the tree, when all the good ones rain down obligingly, leaving the not-yet-ripe ones for another day. Should be compulsory for all fruit trees. Here in Alsace, we have Quetsches. These are proper-size plums with firm flesh & a sharp strong flavour. We use them on all possible occasions – tarts, jam, crumbles, chutney, or just straight off the tree. The basement is full of jars of jam & chutney, while the freezer has many bags ready for tarts & crumbles. We have a couple of old quetsche trees, but it is often easier to just wander along the (disused) road & pick them at a more convenient height from the hedges. (Not orchards, just apparently self-set hedges). I can't imagine how many tons of perfectly good quetsches go completely ungathered in Alsace, but it is a big number.